Did you know that a HEIDENHAIN iTNC 530 control is a vital component in the current manufacture of award-winning new wooden glasses, made by Rolf Spectacles? These unique glasses are growing in popularity, having their start in 2008 with three partners working out of a basement in Austria, and have expanded by leaps and bounds with automated production now underway. The material itself is already unusual: wood, with a figure that is as unique as each human fingerprint. This results in glasses frames that radiate individuality. But success can also be quite demanding: basic prerequisites are excellent design and quality without compromise. The top models must rise above the other eyewear, mostly produced in Asia, through their combination of low weight, no screws, unusual surfaces and perfect functionality. Roland Wolf, his partner Marija Iljazovic, and her brother Martin Iljazovic proved their courage in 2008 when they founded their own brand, “Rolf Spectacles.” Driven by the idea of authentic wooden glasses, they began their R&D in the basement of their parents’ house. Producing precisely manufactured wooden glasses required equipment that was either financially far beyond these young entrepreneurs’ means or that was not even available at all. However, they were able to rely on unconditional self-confidence and friends with expert knowledge. New production equipment, with at least as much individuality as the glasses they produced was conjured with components from used machines and “misused” machines. And then the time had come! Their ambitious goal of individuality and quality without compromise, “Made in Tyrol,” was ready for the market. “When you hold the glasses in your hand, and open and close the temple arms, you then know all you need to know,” Wolf laughs today. “Everything has to come together in this frame …” he adds, and could enthusiastically expound for hours about all the innovations. So the team headed for Paris in 2009, together with plenty of enthusiasm. They presented their new product to the market at SILMO, an international optics trade show. In the competition for innovative design, they spontaneously won the SILMO d’or, the equivalent of an Oscar trophy for opticians. In 2010 they received a Red Dot Design Award, a coveted award for outstanding design. The product became famous practically overnight, and so economic success soon came their way. The unique machines did their job well. But the time-consuming manual steps got in the way of the growing unit numbers. What could be done? The decision was quickly made to find a powerful NC solution that was suited for the precise machining of exotic woods. Thomas Dobler from Deckel Maho immediately became excited about the unusual request, and presented several interesting proposals to the young entrepreneurs. In the end, a DMU 40 mono BLOCK with HEIDENHAIN iTNC 530 got the nod to manufacture the high-quality products. This was a good decision! Nobody in the Rolf Spectacle team had any idea about 5-axis machining, not to mention CNC programming. But as pragmatically and enthusiastically as they approached everything else, Martin Iljazovic delved into the subject. The workshop-oriented programming in the HEIDENHAIN plain-language format made it easy. Now he navigates through the program with ease, and praises the structure function with which he quickly finds his way in long programs. Each wooden frame is unique – even the automated machining of time-consuming production steps can’t change that. But it helps to bring about large unit numbers while fulfilling the high quality expectations. Optimum productivity at Rolf Spectacles begins with the creation of the machining programs for the various eyeglasses models. As soon as the design for a pair of glasses has been decided upon, a CAD/ CAM system is used to prepare it for machining. One intention of the automated machining is to completely remove humans as a source of error. 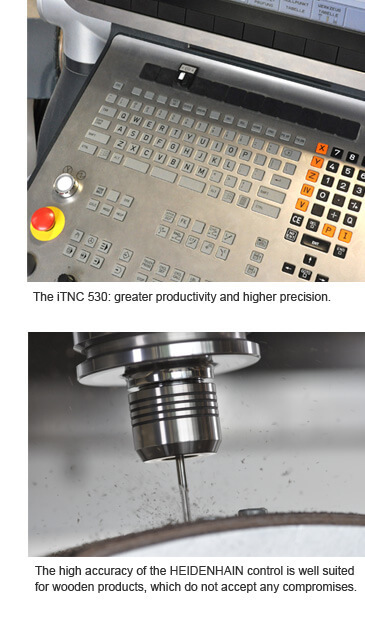 Before machining begins, the iTNC 530 uses a HEIDENHAIN touch probe and the appropriate cycles to check the correct position and orientation of the blanks, which are manually placed on a suction fixture. This idea also shows these youngsters’ creativity: the flexible wooden blanks are held in place in the fixture by means of lower air pressure. This way the wood sits in an exactly defined position, which is a prerequisite for precise machining. Having the automated tool measurement detect which model is to be machined was also a great idea: only a single program is needed for the around 30 different models of eyeglasses. 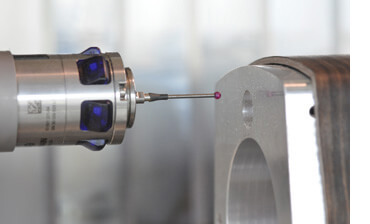 The HEIDENHAIN touch probe simply measures the distance to a defined hole on the fixture being used, and the control then automatically selects the correct machining program. Many steps of the production process were easily solved with features such as the preset table for managing datums, Q-parameter programming and the integrated arithmetic functions. 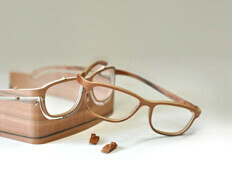 The glasses frames are milled from the workpiece blanks using 5-axis machining. Since very short tools are used for the cutting of the fine structures, dangerously close encounters can occur in the machine’s work envelope. Therefore, Rolf Spectacles makes sure to use the all-encompassing dynamic collision monitoring (DCM option) of the iTNC for certain positioning movements. The delicate wood also presents the machine tool with another challenge: The cutters being used have very small radii, and no cutting data for this atypical material can be found. For this reason, and to increase reliability of the production process, the tools are constantly monitored for breakage. Another disruptive factor is the fine wood dust, which can impair the machine’s functions. Rolf Spectacles has modified all of its machines, and in this case the DMU 40 from Deckel Maho was equipped with a suction bell, which artfully solved this problem. The decision for a 5-axis model was a large step for the authentic newcomers from Tyrol, who had to finance their success with their own means. At the time, the DECKEL MAHO machine was considered to be an extremely large investment, Martin Iljazovic explains. In the meantime, everyone is convinced that this decision was correct. They are particularly excited about the technology they purchased: the dialog-guided operation of the iTNC 530 facilitates adaptations and optimizations for a material for which there is nearly no empirical data. The high accuracy of the HEIDENHAIN control is well suited for wooden products, which do not accept any compromises. The company is doing quite well today, with significantly higher unit numbers and fewer scrap pieces. The new productivity has also given rise to new knowledge. But that is not enough: constantly striving for new ideas, the team is already working on new solutions for the future, since there still seems to be a lot of potential in the new machine, controlled by the iTNC 530. In any case, Wolf and Iljazovic are sure that they hit the bull’s-eye, regarding quality and productivity, by acquiring the DMU 40 controlled by an iTNC 530, because Rolf Spectacles does not make any compromises! A HEIDENHAIN touch probe on a HEIDENHAIN control – a good pair for automated processes.